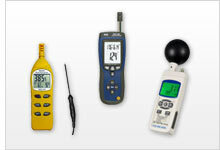 The heat stress meter is mainly used in the workplace. The heat stress meter can detect and classify temperature in relation to the amount of moisture content. What is heat stress? And why is heat stress measured? People who work in installations or with machines that produce a lower energy level or a high emission of temperature can occasionally suffer heat stress (by the influence of body temperature). This phenomenon can also cause physiological symptoms: spasms, feeling unwell and shock that can in some cases prove fatal. The heat stress meter detects and classifies temperature in relation to the amount of moisture content. The global standard description for heat stress is the WBGT (Wet Bulb Globe Temperature Index). With the PCE-320 Heat Stress Meter it is possible to measure climate conditions such as temperature and relative humidity, as well as determining surface temperature of objects simultaneously by using the included external temperature sensor or using an infrared measurement. The Heat Stress Meter offers features such as average value, maximum, minimum, and hold functions at a reasonable price. - Relative humidity: 10 ... 90% r.H.
PCE-330 is a multifunction heat stress meter or humidity test instrument with a quick-response sensor for determining ambient temperature, relative humidity and dew point temperature. Equipped with an easy-to-read dual display, this data-logging indoor air quality (IAQ) meter features a large internal memory with storage for up to 16,000 recorded values. PCE-WB 20SD is a data-logging heat stress meter used to measure indoor / outdoor wet bulb globe temperature (WBGT), black globe temperature (TG), wet bulb temperature (WB), dew point temperature, air temperature (TA) and relative humidity. Thus, this multipurpose data-recording device is an ideal tool for evaluating heat stress risks in different work environments. PCE-330 is an heat stress meter or hygro-thermometer with a quick-response sensor for determining ambient temperature, relative humidity and dew point temperature. Equipped with an easy-to-read dual display, this data-logging indoor air quality (IAQ) meter features a large internal memory with storage for up to 16,000 recorded values.